The weather is turning here - there's a definite crispness creeping in, and though it's lovely and warm in the sun (when it's out), a passing cloud or a patch of shadow elicits an audible 'brrr!' and a quickening of step. It's time to break out the flannellette sheets, time to switch back to the slow cook. It's most definitely baking weather. I've not baked for a while, and this weekend I compensated for it; a surprise petit apple pie on Saturday, and a batch of chewy ginger cookies on Sunday. The pie was a surprise in that there was some shortcrust pastry in the fridge, leftover from my last pie caper, and a bundle of granny smiths in the fruit bowl. I decided at dinner prep time that we'd have apple pie for dessert, so some chopping, rolling, freezing, and baking later - surprise! Apple pie! 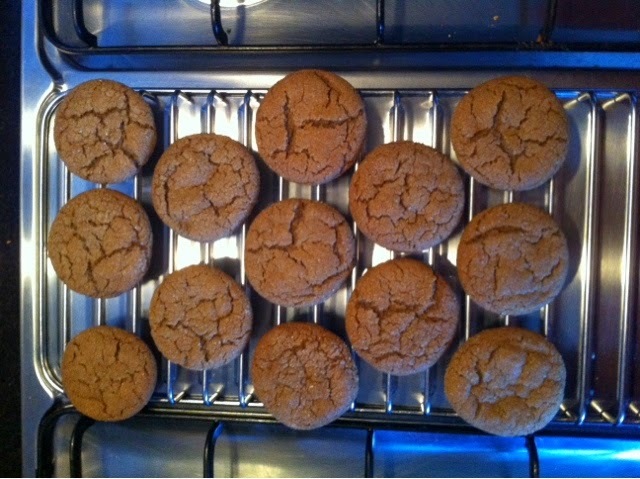 The ginger cookies had been in the back of my mind for a while, and today I decided they'd come to be. I found a gorgeous looking recipe at fork knife swoon, and set about tweaking it to my particular taste and pantry. 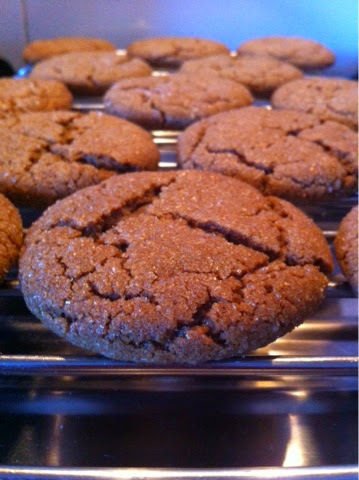 I wanted the ginger to really shine, so I added a handful of minced Buderim Naked Ginger pieces to the mix to add kick. I subbed the molasses for golden syrup, because that's what I had in the panrty; and as for the spices, I omitted the clove because I felt like it. The finished cookies are just as they should be - sparkly and crackled on the outside, chewy and soft within, maintaining a warm glow long after the oven's cooled. A pair of these would be lovely clamped around a scoop of good vanilla ice cream (and what doesn't go with good vanilla ice cream? ); as lovely as they are, I'm sure, with a cup of lady grey, as I happen to be having them now.